June 24 - August 2, 2019 (Please contact The Gan for the extra weeks in August). Half day option (Mini Gan only) until 12:30. Extra care available from 7:00am to 6:00pm. Same rates this year once again! Details can be found by clicking the dropboxes of the registration page. 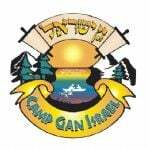 Camp fees may be tax deductible, consult your accountant for details. Tax ID for Chabad of Oregon is 93-0862645. Each of you receive $100 per new Jewish family referred. Please contact us for scholarships or any special discount needs.